Terrys Bed Centre are proud to have been selling Rest Assured beds and mattresses since 1990. At Rest Assured, we know a thing or two about making luxuriously comfortable beds. Rest Assured have been making luxurious, comfortable beds for over 100 years and they know that traditional pocket springs are unrivalled for comfort and support. Their bed-making experts use tried and tested techniques to combine pocket springs with premium fillings, to bring you the ultimate in sleeping comfort. All Rest Assured beds and mattresses are specifically designed to allow for easy movement and optimum back support. This careful balance provides the right environment for the fluids in your spine to repair from aches and pains whilst you receive personalised support for every inch of your body thanks to the pocket springs. All of the Rest Assured beds and mattresses are rigorously tested for comfort and durability. In the BSI approved testing lab, by bed experts and by people like you the beds are put through their paces. Customer reviews are testament to the quality of all Rest Assured products, with almost all the beds receiving at least four out of five stars. Every Rest Assured bed and mattress is made in the UK and come with a 5 year guarantee. Delivery of Rest Assured beds and mattresses is usually in approximately 2 weeks. The Rest Assured Heritage Collection - available ONLY from High Street stores. 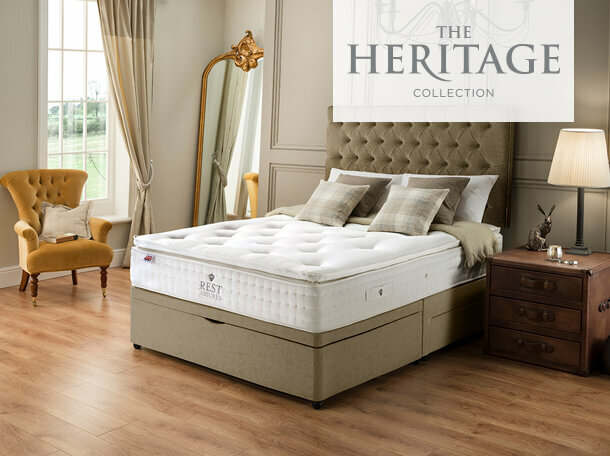 British Heritage is central to this collection, with mattresses, headboards and an extensive selection of bases all handmade in Great Britain. The beds are created using tried and tested techniques to combine pocket springs with premium fillings to provide the ultimate indulgence for your back. We are proud to say that this stunning collection has been tried,tested and approved by the Good Housekeeping institute. We can supply any product from the Rest Assured range, just visit our shop to discuss your requirements or ask our advice. Terrys Bed Centre has been suppling quality brand names beds at very competitive prices since 1989. We have, literally thousands of satisfied customers, many of whom return to us time and again. We deliver free to Nuneaton, Coventry, Hinckley Atherstone and the surrounding areas. If you're looking for a new bed, mattress or bedroom furniture then be sure to pay us a visit! FREE customer parking is available in front of our shop. Delivery of all items within a 15 mile radius of Nuneaton is FREE. FREE disposal of your old bed, mattress and headboard. © 2019 Copyright by Terrys Bed Centre Ltd. All rights reserved.